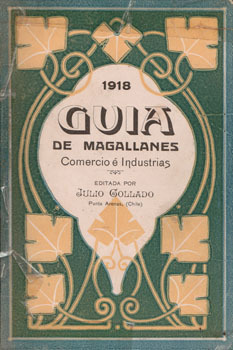 Julio Collado's Guide to Magallanes (1918) is an exceptional "time capsule", and we have been fortunate to have access to a well-preserved copy. Its 250-plus pages provide a thorough inventory of the local business community, interesting period photographs and numerous references to the Territory's inhabitants. The city of 1918 was still young, and many of the inhabitants were first-generation immigrants. Their surnames (British, Croatian, German, Italian, etc. ), many still to be found there today, reflected their country of origin. Thanks to its economic success and enlightened city government, Punta Arenas could offer its citizens a growing local production plus the best of European fashions, at prices which the middle class could afford. For a population of barely 20,000, the choice was remarkable. The preeminence of Punta Arenas as the commercial centre of Patagonia was most apparent during the first two decades of the 20th century. This book reflects that high point in its history.